A year ago we helped Zoosch Jewellery launch their very first catalogue - the one with the beautiful handmade 'collectors' wooden cover (you can revisit that post here). This year their 2016 Classic Collection catalogue is sleeker, smaller, simpler, but still beautiful. It is presented to agents in a pretty box, along with a customised invoice book and ring sizer. 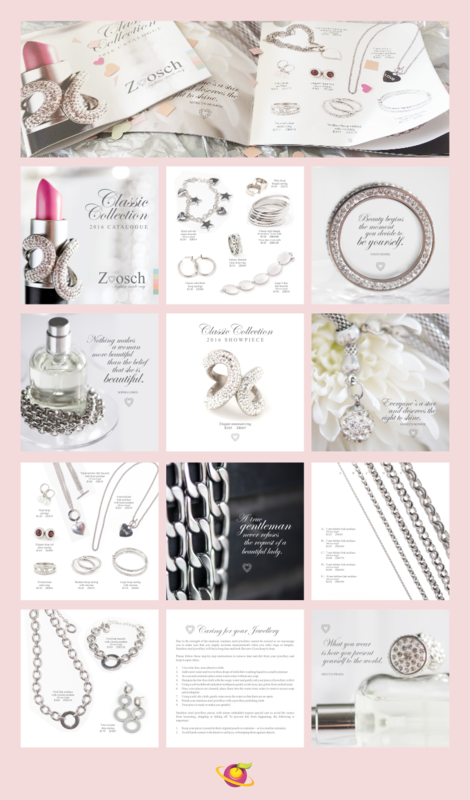 The new Zoosch catalogue has 24 pages displaying breathtaking photos of their sparkling 2016 pieces (shot by CC Rossler, edited by us), and inspiring beauty-related quotes. The catalogue is also available on the Zoosch website as a downloadable PDF. You can access it here. Below are some screen shots of the new Zoosch 2016 Classic Collection catalogue pages to whet your appetite before you go and download it (we know you will).